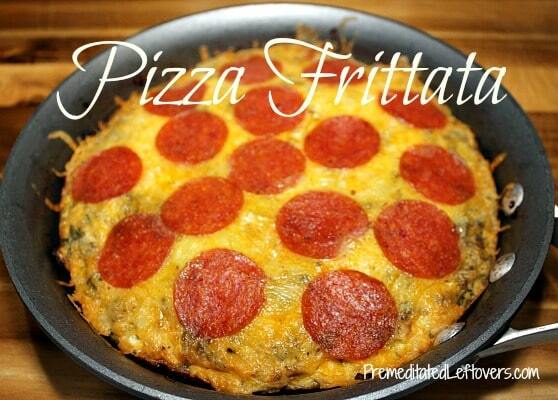 This quick and easy Pizza Frittata recipe works for any meal of the day! 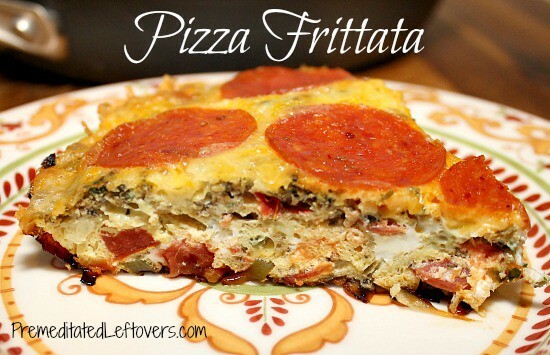 I was going to say this Pizza Frittata Recipe is a hit with my kids, but actually, it is a hit with everyone. I love frittatas because they are fast and easy to make. You can create an elegant frittata or you can get creative with leftovers. They can be served for any meal of the day. I often serve a frittata for breakfast when we have company, but I also serve them to my kids for dinner on busy nights. Join our Quick & Easy Healthy Meals FACEBOOK group! In addition to a free monthly meal plan, this group will feature new recipes, cooking tips, and time-saving tricks to help you get dinner on the table despite your busy schedule. Add olive oil, tomato, onion, pepperoni, peppers, and garlic to a 10” oven safe frying pan. Cook over medium-high heat for 6 – 8 minutes or until onion is translucent. Add eggs to a small bowl and beat with a fork or egg beater. Add thyme, basil, oregano, and pepper to eggs. Mix well. Sprinkle cheese over the top of the frittata. Arrange pepperonis on top of the cheese. Place frying pan 4 –6 inches beneath the broiler. Broil for 2 –4 minutes or until the eggs are cooked through and beginning to brown. My family enjoys all of my frittata recipes, but my Pizza Frittata is their hands down favorite. I include cut up pepperonis and other pizza toppings inside the egg mixture and then place them on top creating a really flavorful dish. it makes me hungry – looks so delicious!